The circular saw is arguably one of the most versatile tools that you can have in your workshop or at home. This can be used for so many tasks and will give you incredible results. When you have the mini circular saw and use it for a while, the blade becomes dull. At this point, you may choose to sharpen the blade or replace it so as to get efficient cutting. You can easily tell when the blade is becoming dull as the saw’s motor will start to strain and the cutting takes longer than usual. 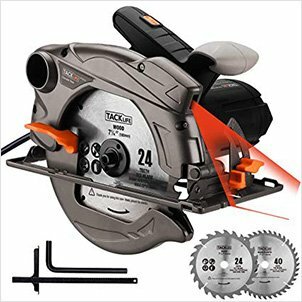 Why Change Circular Saw Blade? There are so many reasons why you may have to change the blade of your circular saw. The main reason is when the blade is dull and cannot continue to produce clean results, as before. Most circular saws will have a tungsten carbide-tipped blade and often, you will be required to change the blade. This is due to the fact that there are specific blades that are used for specific tasks, depending on the material that you want. There is also the issue of using the right blade for the right materials and as a result, you will need to replace the blade. For each material that you intend to cut, you should pick the specific blade so as to get the required results. The type of cut you intend to make is also a cause for you to change your blade. Blades that have more teeth and smaller gaps between teeth are meant for clean and smooth cuts. These are some of the key reasons to change blades. When this happens, you will need to be sure about how to go about the process of changing the blade on your circular saw. 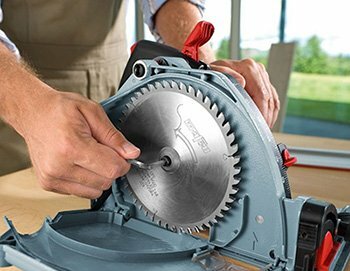 How To Changing The Blade on a Circular Saw? Generally, when you use the circular saw, you will hardly need to change the blade if you do not use it often. However, if you are a professional who uses the saw often, then you may have to change the blade. In addition, if you need to make different types of cuts, using specialized blades, then you need to keep changing and replacing the blades with the right one. It would be important if this can be done in a short time and easily. There are those that come with a blade release lever, which makes it easier to change blades quickly. However, the older models require a little bit of work when you need to replace the blade. You will have to loosen some bolts, which are used in holding the blade in position. There are models that have a rotation lock that is essential in fastening the shaft that holds the blade. In this case, you will need to use a wrench to unscrew the bolt. However, in cases where there is no rotation lock, you may stick a bar through the center part of the blade to hold in when you unscrew the bolt. The process of changing the blade will depend on the type of circular saw that you have. However, in this article, we will look at some of the basic steps that you will take when changing the blade of the saw. Remember that you should consider the instructions from the manufacturer as the top priority. As a safety measure, you should start by unplugging the saw from power. If you are using the modern cordless models, then remove the battery, for your safety. This is an important measure as you would not want to turn on the saw, while your hands are caught up in the blade. It is important to note that you will need to ensure that you have the right blade size and one that is compatible with the saw. For instance, you need a 10-inch blade for the 10-inch circular saw. Ensure that you saw is on a secure surface then remove the blade guard. This is to make the blade exposed and allow easy access to the blade. If you have a model that has an arbor lock, this would be the right time to engage it. The arbor is a shaft, which the circular saw blade sits on. When you lock it, this will hold the nut steady as you loosen it so as to free the blade. In the event that your model does not the arbor lock, you should wedge the blade into a wooden surface so as hold it steady. Fit the wrench into the arbor nut and then rotate it in the direction that your blade usually turns. In most cases, the wrench will come with your saw and it is advisable to use it, as it will be the best option. For the worm drive saw, the direction will be clockwise while for the direct drive saw it will be counterclockwise. This allows you to remove the blade. Now take the new blade and slide it into the arbor. This should be the opposite of how you removed the old blade. Then slot the nut back into place and then tighten it with the wrench. It is imperative to make sure that the nut is not over-tightened. The nut will continue getting tightened when you are making cuts, so there would be hardly any case of under-tightening it. All you need to do is ensure that it is firmly in place. Reconnect the saw to power or replace the battery, for the cordless model and try it out. You should check if there are excess vibrations and make the necessary adjustments. If everything checks out, you can resume cutting. Anytime that you are using a circular saw, wear the right protective clothing like gloves and safety goggles. Do not wear clothes that are buggy and oversized as this could be caught by the blade of the saw. Disconnect the tool from power, or remove the battery before making any adjustments. Allow the blade to come to a complete stop, to make any changes. Always use the right blade for each task. 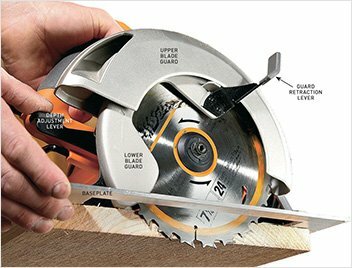 If you are looking for more information about how to safely use a circular saw go here right away. As you can see, the process of changing circular blades is not complicated. With the modern models, it is even much easier and you can go back to the cutting process in no time. Sharpening blades may be tedious and not worth the struggle, considering that the blades are not really expensive. When you go through the process a few times, you will be changing the blade like an expert, without any struggle.